Kancera AB would like to thank you for your interest in our company and for visiting our website. Please read the following website policy carefully before using this website. We want you to know that we respect your integrity, and you can find out more about this in our integrity protection policy. By using this website, you are giving your consent to this website policy. The website policy explains how the information on kancera.com may be used in such a way as not to infringe copyright or break the rules for linking to the website. The section entitled “Kancera AB’s integrity protection policy” explains how your personal information – i.e. information that can identify you as a user – will be processed. The information on this website is of a general nature and should not be used in isolation, or as the sole reason for a decision on issues of importance. Kancera AB strives at all times to ensure that the website is accurate, complete and up-to-date. However, misleading information may result from typing errors, external influences and technical faults, for example. This means that Kancera AB cannot guarantee, nor be held liable for, the accuracy, completeness and currency of the information. 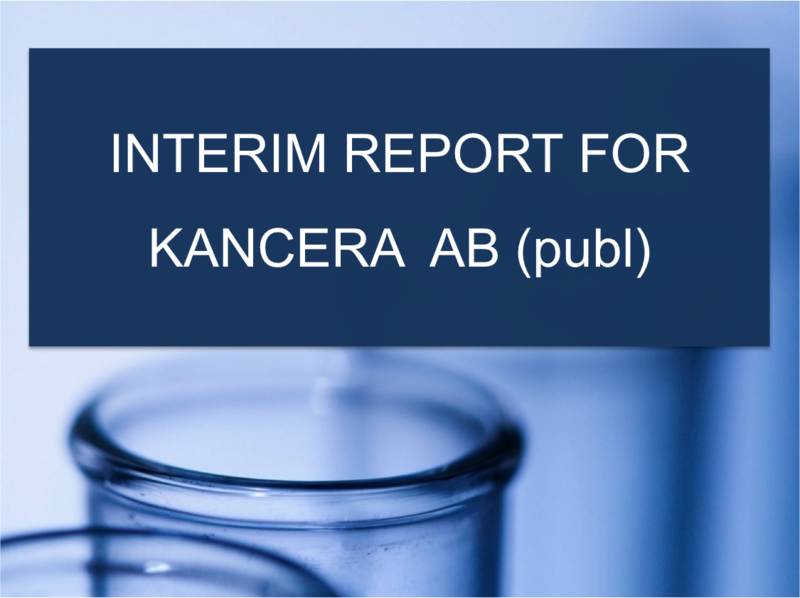 The content of the website is owned by Kancera AB and is covered by Swedish and international legislation. All rights reserved. The unauthorised use or distribution of the content of this website may constitute a breach of copyright, trademark legislation and/or other Swedish international legislation, and may give rise to legal proceedings. The content of this website may not be changed, sent, recreated, published, licensed, transferred or sold without the prior written consent of Kancera AB. The website may contain images that are the property of other copyright holders. All links to the website must be to the home page, unless otherwise agreed with Kancera AB. When a link is made, all material from the website must be opened in a separate window and must not be presented alongside a trademark or logo from another website. Kancera AB cares about your integrity. Please read through the following to see what the integrity protection policy involves. The policy is about how Kancera AB processes the personal information that Kancera AB receives and collects through the website www.kancera.com Personal information is information that can be used to identify you. This includes, for example: your name, address, e-mail address, telephone number, logs from your web browser, your IP address and cookie information, and information that is not public elsewhere. The policy does not cover other companies not owned or controlled by Kancera AB, nor other persons who are not employees of Kancera AB. Kancera AB cannot accept responsibility for your integrity or the content of external websites to which there may be links on this website. Kancera AB collects personal information such as names, e-mail addresses and other information voluntarily submitted by the user. The personal information that you have submitted is used solely for the purposes that you have requested. Kancera AB receives information from your web browser, such as the IP address, cookie information, and which page you are visiting, and automatically stores this in the log files on our server. Kancera AB uses the information for the following purposes: to improve the content of the website, for user statistics, to respond to your enquiries relating to products and services, and to improve our services. Kancera AB does not sell this information to third parties. That the website contains cookies. How cookies may be avoided. A cookie is a small text file that the website you are visiting saves to your computer. Cookies are used by many websites to provide you, as a user, with access to various functions. It is possible to use the information in the cookie to monitor a user’s surfing. There are two types of cookie. One type saves a file on your computer for a long period of time and serves to facilitate the individual user’s activities. It is used, for example, for functions that require the user to log in, register or order something from the website. Cookies are also used to enable the number of page displays and visitors to be measured, both for our internal statistical systems and for our supplier of an external such system. The information gathered for statistical purposes is anonymous and contains neither names, e-mail addresses, nor any other information that may be linked to a particular individual. The other type is called a session cookie. While the visitor is on a website and surfing, this type of cookie is stored temporarily in the cache memory of the visitor’s computer – for example, to keep track of which language has been selected. Session cookies are not stored for any length of time on your computer; instead, they disappear once you close your web browser. On this website, we use both types of cookie to make it easier for you to use our pages. If you do not wish to allow cookies, you may block them using your web browser (the method of controlling cookies may vary somewhat between various versions of the web browsers). If you are using Internet Explorer, do as follows: Go into Tools > Internet Options, then choose the Privacy tab and click on Advanced. You can then choose whether to accept or reject cookies, or whether you would like a prompt to appear everywhere where cookies occur. If you are using Netscape, do as follows: Go into Edit, select Preferences and then click on Privacy&Security, followed by Cookies. Here, you should select the appropriate option. Kancera AB may revise this website policy at any time by updating it. When using the website, you may require additional software to access all the information.